Go from being a good manager to an extraordinary leader. 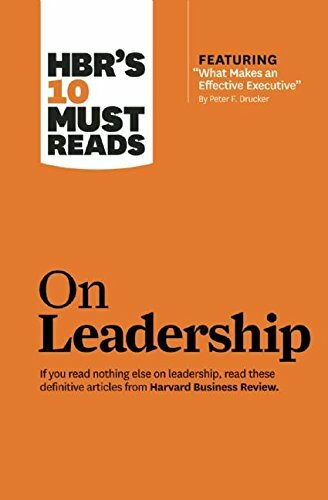 If you read nothing else on leadership, read these 10 articles (featuring “What Makes an Effective Executive,” by Peter F. Drucker). We've combed through hundreds of Harvard Business Review articles on leadership and selected the most important ones to help you maximize your own and your organization's performance. This collection of best-selling articles includes: featured article "What Makes an Effective Executive" by Peter F. Drucker, "What Makes a Leader?" "What Leaders Really Do," "The Work of Leadership," "Why Should Anyone Be Led by You?" "Crucibles of Leadership," "Level 5 Leadership: The Triumph of Humility and Fierce Resolve," "Seven Transformations of Leadership," "Discovering Your Authentic Leadership," and "In Praise of the Incomplete Leader."